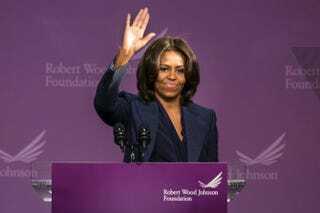 First lady Michelle Obama speaks to students at Edward A. Reynolds West Side High School Feb. 5, 2015, in New York City. First lady Michelle Obama is scheduled to deliver the commencement address at Alabama’s Tuskegee University, one of the nation’s top HBCUs, next month, AL.com reports. According to the report, the address will be part of the first lady’s Reach Higher initiative, through which she aims to inspire every student to complete his or her education past high school. She is also set to make addresses to the graduating classes at Oberlin College in Ohio and the Dr. Martin Luther King Jr. College Preparatory High School in Chicago under the initiative. The commencement at Tuskegee will take place May 9, with Obama set to make remarks at 11 a.m.